Find out how to make turkey and fennel pie with this easy recipe – made with Jus-Rol’s all butter puff pastry and great for using up leftover turkey. Heat oil in pan and gently sauté leeks until just soft, add fennel and cook for further 5-8 minutes. Stir in juice and rind of lemon, then leaves from the thyme and the wine, bring to boil and then simmer for 2-3 mins. Add the turkey and crème fraiche, stir well and allow to cool. Preheat oven to 220ºC (200ºC fan assisted)/ 425ºF/Gas 7. Place cooled filling in a pie dish, roll out pastry large enough to cover the dish with some to spare. Trim strips from the edge of the pastry approx. 2 cm/1â wide, brush dish rim with beaten egg and place pastry strips on top to form a pastry rim. Brush rim with beaten egg, carefully place large piece of pastry over dish, press edges together firmly and trim off excess with a sharp knife. Knock up edges and flute if desired, make a small hole in centre of lid to allow steam to escape. 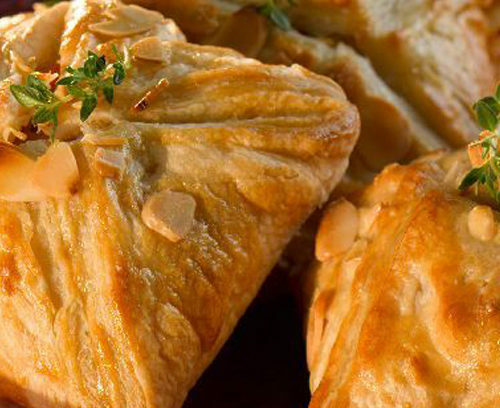 Brush with beaten egg and sprinkle with flaked almonds, bake for 25 minutes until pastry risen and golden.